When we say that we want children to be able to “Organize, represent, and analyze information using concrete objects, pictures, and graphs” with teacher support, what do we mean? In this benchmark, the word information means “what children have found out about something.” Information is “facts” or data that can help children answer questions about an object or event—questions that begin with words such as what, when, where, who, how, and why. Information can include location, size, shape, texture, quantity, time, and other important facts and details about the object or event. Preschoolers organize information when they collect, label, sort, or sequence items that meet certain characteristics. When children “represent” information, they show in an intentional way what they have observed or found out about something. They might display their knowledge using drawings, diagrams, words, photographs, audio recordings, or other media. The 10.B.ECa benchmark description mentions several ways that children might represent information—using concrete objects, creating pictures, and making graphs. Concrete objects are “real” things that a person can see, touch, smell, etc. Concrete objects might include specimens or artifacts that children collect, organize, and label. For example, some children who are studying doors might collect keys, sort them, and help the teacher make labels with information about each key. For example, a label might say, “key to front door” or “antique key.” Collecting and labeling these concrete objects help the children keep track of what they have found out and represents their findings for other people. Figure 1 shows a collection of keys that has been organized in a container but not labeled. Models are another type of concrete object that children might use to show what they have learned about something. Models can be made from clay, blocks, “boxes and junk,” wood, and other materials. Models may be small enough to fit on a shelf or large enough for children to play in. The teacher can guide and promote children’s efforts to analyze information by asking them to identify the various parts of the model, drawing, etc., and explain how it works. For example, Figure 2 shows a preschool boy’s representation of a car wash made from blocks after his class made a site visit to a local car wash. His construction includes a roof, driveways leading to and from the building, and a conveyer made of arch-shaped blocks placed upside down. Figure 3 shows a preschool child’s model of a car wash (shown here without a roof), using a shoe box and other found materials, based on data collected during a site visit to a car wash. The model has an entrance for cars, an exit, and red and green signal lights. It also includes the washing machine that moves over and around the cars. Figure 4 shows a large representation that some preschoolers made of the mail truck that delivered mail to their school. They have included windshield wipers, headlights, turn signals, the grille, and other important details. Their mail truck, made from an appliance box, is large enough that two to three children can play inside it. Children might also use concrete objects to convert the dramatic play area into a place that they have been investigating—a hospital, a pet store, a fire station, etc. For example, Figure 5 shows a “pizza restaurant” created by a preschool class. After learning about local pizza restaurants, the children designed their restaurant using ideas from notes and sketches they had made during field work. They rearranged furniture; added props such as pizza boxes, tablecloths, and a toy cash register; and constructed a model of a pizza oven from a cardboard box. They then took roles as workers operating the business based on what they had learned about pizza restaurants. The pictures that children use to represent their data might be sketches, drawings, photographs, paintings, or other flat representations of objects or activities. The pictures are not “art”—they are meant to convey information about the objects to others. For example, Figure 6 shows a child’s field sketch of a shopping cart she observed when her class visited a local store. The tempera painting in Figure 7 was made by a preschool boy to show what he had found out about a car wash. His painting shows the darkness inside the building as well as the lighting and some construction details. Figure 8 is a series of digital photographs taken by some preschool children. The children organized the photographs to show the growth sequence of some daffodils they planted. With some help from the teacher, they mounted and labeled their pictures. Pictures can also include videos taken by children. A graph is a diagram that helps to compare quantities or amounts of things. Children may use a variety of graphs to show certain kinds of data. Graphs that use groups of real objects are called “real graphs.” The real graph in Figure 9 shows the different subjects of postcards in a collection: three that depict people, four that focus on buildings, and three that depict animals. Pictographs use pictures (drawings, magazine cut-outs, etc.) to show data. The pictograph in Figure 10 records the number of seeds found in an apple, a peach, a cherry, and an orange. This pictograph allows children to quickly compare the quantities. Surveys can function as graphs, too. Figure 12 shows a survey constructed as a T-chart, which is easy for preschoolers to use when they ask questions with only two possible answers. explain what she has found out to peers or adults. Practice organizing and representing information yourself. Make sketches, build models, and work with a variety of media (e.g., clay, paint, found objects) so you can draw from your experience with those activities when you talk with the children about what they are doing. Invite children to collect objects related to what they are investigating. Depending on topic, these items could include tools, machine parts, seeds, buttons, flyers, etc. Help them create labels for the collection and for parts of the items they have collected. Write their words or type them into the computer and mount a card with the child’s words next to the item. Help children become careful observers. One way to do this is to encourage them to make sketches and drawings of what they are learning about. They might draw things they see on site visits or things they have collected and brought to the classroom. It can be especially helpful to have them revisit an object once or twice. Most children notice more details each time. Talk with the children about the equipment and materials they will need to organize and represent the information they collect. What will a child need to take a survey? Make a drawing? Tally the number of red cars in the parking lot? Invite several children to work together to group artifacts or other items they have collected according to similarities and differences. Ask them to talk about what helped them decide how to group the items. Figure 13. In-depth investigations give children opportunities to collect data. Figure 14. Teachers can encourage children to collect objects related to a topic they are investigating. Figure 15. Sketching and drawing help children become careful observers. Figure 16. “T-chart” surveys are one way to introduce young children to basic principles of making graphs. Help children think about ways they might show others what they have found out about a topic. Suggest using drawings as the basis for making murals or three-dimensional representations from clay, cardboard, wood, wire, and “found” materials. What materials does a child want to work with to make a mural, a sculpture, or a working model of something—paint, clay, cardboard, wood? Give children time to practice using these materials before they get involved in a complex representation. Bear in mind that some children may be challenged by the fine-motor work involved in tasks related to organizing and representing data. They may become frustrated. On the other hand, if they feel a sense of purpose about expressing what they know, they may work especially hard to create representations that classmates will recognize and understand. Some children will just need more time and encouragement from teachers and peers. Working with a partner may also be helpful for a child with such issues. Can the child—with or without adult help—organize information or items he has gathered about a topic, in at least one way, and explain what he has done? Can the child represent that information by drawing, making a model, or other method? Can the child analyze (make sense of) information in a way that allows her to explain it clearly to others? as needed (e.g., use information depicted on a chart or graph to describe which classroom games are most popular). Notes on your observations of the child relevant to the benchmark—what he does and how he does it, what he says to peers or adults, how he works through problems, etc. Video and audio recordings (or transcripts of relevant portions) of the child involved in related activities such as class discussions or field work. You may also want to include notes on the child’s comments about what he was doing and thinking when the recordings were made. Photographs of children in activities related to the benchmark. For additional insight, it’s a good idea to ask a child to tell you what is going on in a particular photograph. Samples of the child’s work sketches and drawings, photographs, graphs, charts, models, etc., in chronological order. It’s a good idea to include notes about changes in the details and accuracy in the child’s representations over time. You might also include any comments the child makes about a particular work sample. Samples of items the child worked on with peers (e.g., a collection, a list, a graph, a model) along with your notes about what you observed as they interacted. Compare what the child depicts in a drawing, model, or other representation with what actually exists. What does it show about his knowledge and understanding of related concepts? Did he depict the most important parts of the object? Does he seem to grasp the relative size of the parts and their placement? If he labeled the parts, did he name them correctly? Note how effectively she uses tools and art media (pencil and paper, clay, found objects, and fasteners) in his representations. Note whether his graphic organizers, such as Venn diagrams, charts, and graphs, clearly show what he wanted to express. 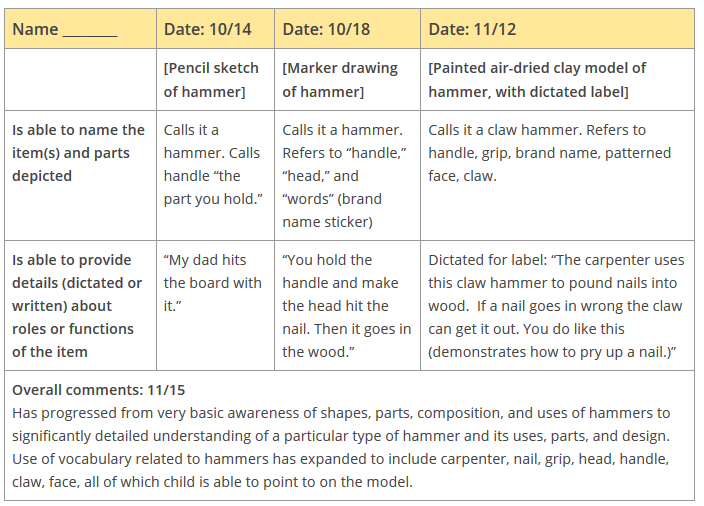 Compare a child’s later or final work samples with earlier samples to see how her understanding or skills have changed. What details do you notice in later work that were absent in the first sample? Compare a series of the child’s representations of the same object as a summative assessment, making a rubric. The teacher took photographs of the child’s representations of a hammer and dated them. The columns with dates include teacher’s comments on the type of representation as well as comments about the representation. How clear and thorough are the child’s responses? Look also at her dictations and conversations about the topic to see what she has said and asked about the topic. It’s also a good idea to listen to children’s comments and questions about classmates’ representations. Are they asking for details? Correcting a friend’s misunderstanding? Showing that they misunderstand something? Individual benchmarks may be derived from research or from what is generally understood to be the basis for good practice for teaching and learning. Benchmarks frequently are related to principles and standards developed by professional organizations concerned with the specific content area, such as those of the National Council of Teachers of Mathematics (NCTM), which are themselves based on both research and professional knowledge. Illinois Early Learning Benchmark 10.B.ECa is related to specific standards developed by the National Council of Teachers of Mathematics (NCTM) and to recommendations in a joint position statement of NCTM and the National Association for the Education of Young Children (NAEYC). Parallels to Benchmark 10.B.ECa can also be found in the Head Start Child Outcomes Indicators. Domain: Science, Scientific Skills & Methods: Collects, describes, and records information through discussions, drawings, maps, and charts. Representation Standard for PreK–2: Instructional programs … should enable all students to … create and use representations to organize, record, and communicate mathematical ideas; select, apply, and translate among mathematical representations to solve problems; use representations to model and interpret physical, social, and mathematical phenomena. Process Standard: Create and use representations to organize, record, and communicate mathematical ideas. Data Analysis and Probability Standard: PreK–2 Expectations: Represent data using concrete objects, pictures, and graphs. Example of Typical Knowledge and Skills, From Age 3 to Age 6: Organizes and displays data through simple numerical representations such as bar graphs and counts the number in each group (p. 21). “In high-quality mathematics education for 3- to 6-year-old children, teachers and other key professionals should … use curriculum and teaching practices that strengthen children’s problem-solving and reasoning processes as well as representing, communicating, and connecting mathematical ideas” (p. 3). “Experiences and intuitive ideas become truly mathematical as the children reflect on them, represent them in various ways, and connect them to other ideas” (p. 6). “When children pursue a project or investigation, they encounter many mathematical problems and questions. With teacher guidance, children think about how to gather and record information and develop representations to help them in understanding and using the information and communicating their work to others” (p. 7). Clements, D. H. (2004). Major themes and recommendations. In D. H. Clements & J. Sarama (Eds. ), Engaging young children in mathematics: Standards for early childhood mathematics education (pp. 7–72). Mahwah, NJ: Lawrence Erlbaum. Based on understanding of development of mathematical concepts in early childhood, the author recommends that children initially use physical objects to make graphs, progressing to picture graphs, then line plots, and, finally, bar graphs. DeMarie, D. (2001). A trip to the zoo: Children’s words and photographs. Early Childhood Research & Practice, 3(1). The author analyzed photographs taken by preschoolers and older children who were given cameras on a trip to the zoo. Unlike the older children, preschoolers tended to photograph familiar animals such as chipmunks rather than zoo animals, as well as clouds, the ground, and other items not unique to the zoo. Evangelou, D., Dobbs-Oates, J., Bagiati, A., Liang, S., & Choi, J-Y. (2010). Talking about artifacts: Preschool children’s explorations with sketches, stories, and tangible objects. Early Childhood Research & Practice, 12(2). In a study of children’s exploratory learning, the authors found that preschoolers’ interaction with tangible objects generated more talk and exploration, and provided more insight into their ideas about possible functions of artifacts than did interaction with sketches or stories about similar objects. Hoisington, C. (2010). Picturing what’s possible: Portraits of science inquiry in early childhood classrooms. Collected Papers from the SEED Conference. Among other aspects of drawing, the author noted a variety of ways in which children used drawing to express the speed and direction of water flow. Legare, C. (2014). The contributions of explanation and exploration to children’s scientific reasoning. Child Development Perspectives, 8, 101–106. doi:10.1111/cdep.12070 The author discusses how children’s explorations and their efforts to explain phenomena work in tandem to enable them to reach new understandings of their experiences. McGuire, P. (2010). Supporting high quality teacher-child interactions in Pre-K mathematics (Doctoral dissertation). The author investigated use of “five-frames” as instructional scaffolds (e.g., assisting children in counting, partitioning, and tagging concrete objects) and as ways to represent numerical quantities and help them connect different numerical representations. Sgroi, L. A., Gropper, N., Kilker, M. T., Rambusch, N. M., & Semonite, B. (1995). Assessing young children’s mathematical understandings. Teaching Children Mathematics, 1(5), 275–277. The authors discuss the opportunities presented by graphing activities for assessing children’s knowledge. Graphing is appealing to young children, complex enough to afford opportunities for questioning and can be linked to subject areas other than mathematics. The authors compare how children’s behavior as photographers and the photographs they create may vary across ages. The following is a list of Illinois Professional Teaching Standards that may be addressed by completing the Benchmark 10.B.ECa MELBA (for use by instructors and students in teacher education programs). Althouse, R., Johnson, M. H., & Mitchell, S. T. (2003). The colors of learning: Integrating the visual arts into the early childhood curriculum. New York: Teachers College Press. Mathematical Thinking: Patterning, Geometry, and Measurement in Early Childhood Education (DVD). Arlitt Instructional Media. Davoli, M., & Ferri, G. (Eds.). (2000). Reggio Tutta: A guide to the city by the children. Reggio Emilia, Italy: Reggio Children. Thompson, S. C. (2005). Children as illustrators: Making meaning through art and language. Washington, DC: National Association for the Education of Young Children. I Am Clay (DVD). K-Play.